That’s from an email message he received from Network Solutions a couple of weeks ago and Mike’s problem is that he doesn’t own the domain mswssi.xyz. While Mike does own the domains mswssi.com, mswssi.net, and mswssi.org this was a domain he knew nothing about so the letter made no sense. Mike called Network Solutions customer service and discovered that he had been “given” the domain by the company but, to his knowledge, had never been told anything about it. Mike said the CSR he spoke to was not friendly and “clearly did not want to deal with it” (this was one of the reasons I took all of my domains away from Network Solutions some time ago; well, that, and the evermore awful tech support). The CSR said the addition of the .xyz domains to hosting accounts was complimentary for the first year. Mike said "All news to me and I suspect thousands of others." The story behind Network Solutions giving away .xyz domains goes back to June last year when a bunch of the new generic top level domains (gTLDs) were turned loose. In an attempt to establish the value of .xyz domains, the XYZ Registry did a deal with Network Solutions selling them thousands of domains which Network Solutions automatically assigned to their customers with matching .com domains. Network Solutions automatically allocated free matching .XYZ domains to accounts holding .com domains with an “opt out” clause, some of which were expired or pending deletion; a clear indication their registrants never intended to retain the .com, much less accept the .XYZ freebie. In just ten days last June Network Solutions “registered” nearly 100,000 domains which was described by DN Journal as "papering the house" and propelled .xyz into fourth place among the new gTLDs last June. The sad thing is that it appears the ploy worked because, according to ntldstats.com, the .xyz gTLD now ranks number 1 with 1,110,496 registrations and a 16.36% market share, over three times greater than the market share of the number two gTLD. This is not the only ethically dubious business tactic that Network Solutions has attempted over the years and, indeed, the list of complaints about the company just gets longer and longer (see Consumer Affairs for a sample of the vitriol dished out by their customers). 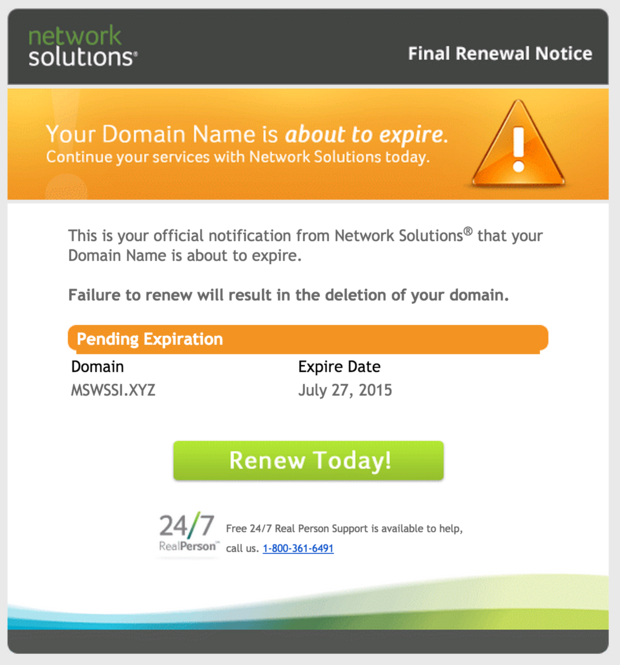 So, if you’ve recently received a domain expiration notice from Network Solutions that didn't make sense, be warned, it may be for a domain you never registered, haven’t used, and really don’t care about. Michael will be moving his domains to another registrar as soon as possible.